Despite the gray, wintery skies of this morning, when you step through the fogged plastic of the greenhouse, you’ll find a sea of green. Not only the green of grass or iris shoots we normally associate with this time of year, but an array of seedlings with many shades: sour-apple-green, purple-blue-evening-mountain, lime-green-of-the-sea. The experience of spring, as farmers, is usually less about truly seeing what’s around us. We often forsake the true sight that allows for a slowing down, in order to throw ourselves into the necessary work. Just getting things done. 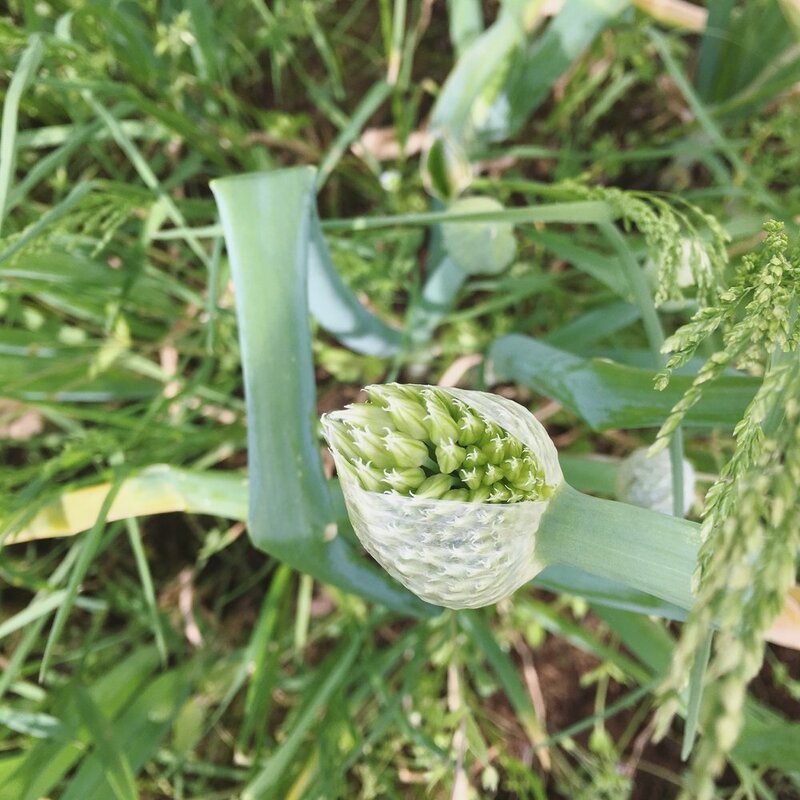 Every year, we have felt we were already “behind,” even when the growing season was just getting started, and each task would hopefully be in service of the months ahead, but there was much fear and anxiety about what the year would look like. When the quiet of January turned into February and March, we seeded just enough to completely fill our greenhouse and began to turn the soil in our hoop houses. One bed at a time, one seed at a time. For whatever reason, this year is already feeling lighter, slower, even when we are quicker with each task and more confident. Maybe this is the gift of experience that we’ve been looking for since the farm began its journey. Maybe understanding each aspect of the farm in a more holistic way is relieving us of unnecessary pressure and helping us just be. Whatever the reason, we are grateful to be tilling beds and planting, once again, while also seeing the farm grow at its pace. At least slightly slower, and with fresh eyes. As I mentioned in last month’s FW, we have been working on many other projects this year, in addition to cultivating a healthy amount of produce. Here is a sneak-peak of one project that we have steadily made progress on over the last couple of months! I’m sure you can tell that it involves a different set of tools and a more indoor setting, and we are very excited to reveal this new aspect of the farm within the next month or so. Stay tuned! Also, stay tuned for the re-opening of the farm store! Things will be looking a little different when you come, which is exciting! Look forward to the farm store in mid-May or early June. A special thanks to everyone who helped us by voting on our grant application last month! We unfortunately weren’t selected, but we are hoping to still plant a few blueberry bushes this year if we can. For now, we are focused on prepping the new land (closest to the woods) for planting the greenhouse seedlings in the next weeks, seeding more lettuce, and working on new aspects around here that we hope will bring the whole farm together. Sunday, the wind started picking up as it does during this time of the year and we witnessed a white pine tree press its roots up from the soil over the course of a few hours. We kept our eyes peeled, but when it finally did fall, we weren’t there to see it split down, taking branches and a boxwood with it. With the fall of the white pine, the inclination was to be a little shocked, to have witnessed it, and disheartened that the power of the wind mixing with the soft, wet ground could cause so much destruction. We were surprised, instead, at how much light and space the clearing of this tree created, which normally cast a shadow over the entrance of the farm and the farmhouse. What it reminded us is that allowing an enormous weight to fall could open up space for new growth, and this is the very idea that we have had a chance to contemplate over the last few months. After the turbulent nature of last growing season, we really interrogated our plan for 2019. We have decided not to pursue a CSA this year in order to focus on other outlets, such as wholesale and our on-farm store, that we feel will positively grow the farm in the right direction. It is no small thing for us to shift our focus in this way and we will miss the connections we’ve made through CSA. 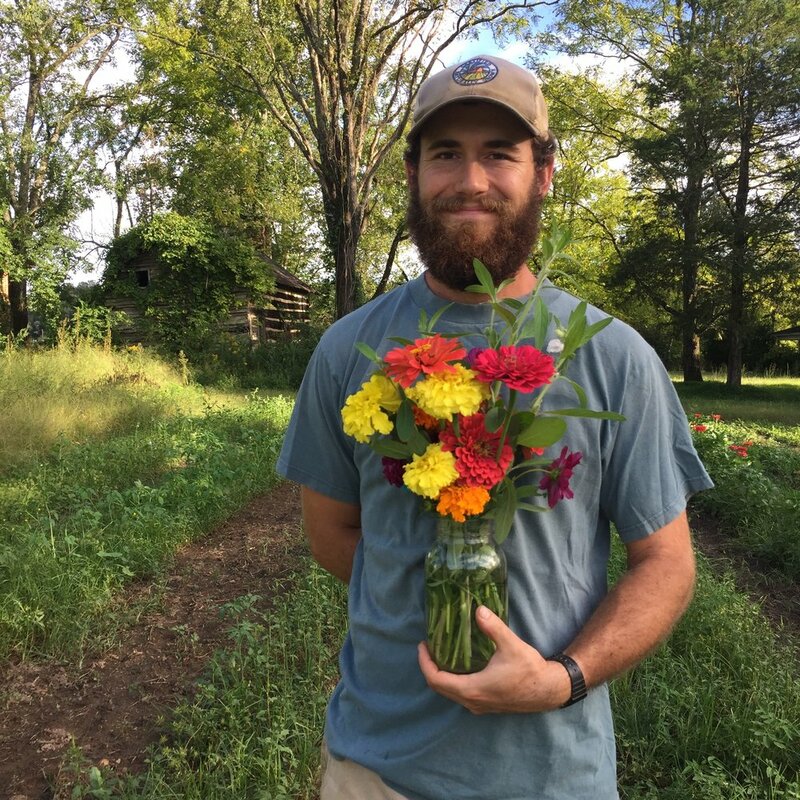 One important note is that we hope to grow the farm in such a way that we will be able to run a CSA program in the future, so we are not saying goodbye forever! So, let’s talk about the exciting part and a few highlights from this year already! Instead of spending so much of our time driving to do deliveries, we plan on spending more time on the farm. This will allow us to grow better quality produce, beautify our space, and open this place up more to the public. One of our major focuses on the farm this year is our farm store. Admittedly, we started out this outlet a little rocky - without even proper signage by the road! - but we were blown away by the response from our community to show up for the small amount of produce and bread we were offering. This year, the farm store will be open and stocked with more produce, and I am incubating a project to make my sourdough more accessible to you. 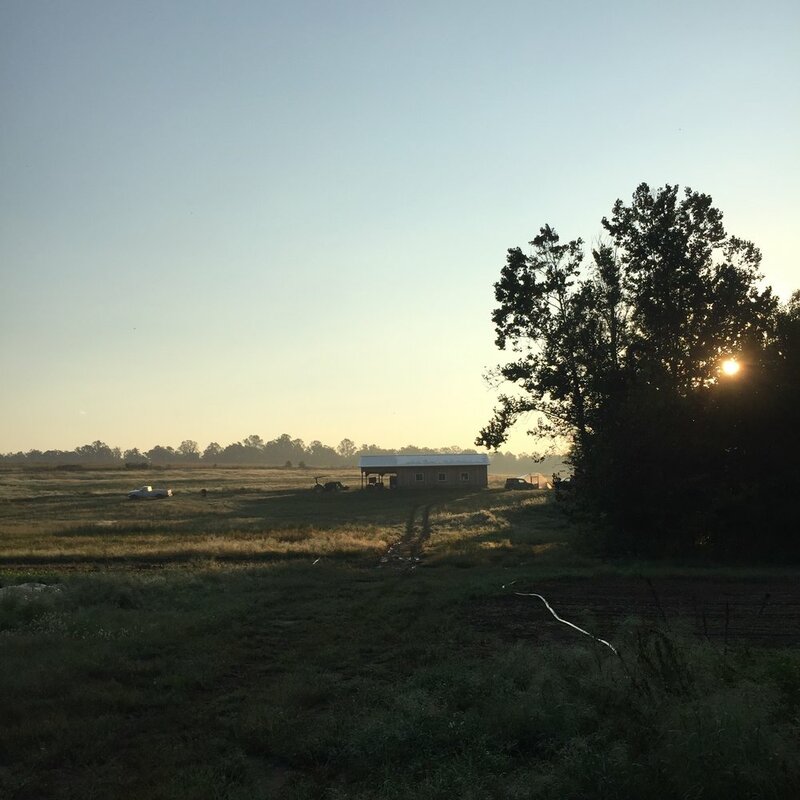 The farm store will be our most direct connection to you, our supporters, friends, and family, and we can’t wait to make this space one that is worth driving to. Make sure you are subscribed to our newsletter for updates! In changing the landscape of our plan for the farm, I am also revising the model for The Field Walk. As you can see, the website will continue to be the new landing page for these newsletters, which I wanted as a way to have them permanently available to you. Last year, I was writing, photographing, editing, and sending two newsletters a week, which felt important because Kyle and I love to share the farm and its happenings with folks who have helped us grow this place into something special, but it did become exhausting and burdensome if I’m honest. So, I will be cutting back to one newsletter a month, with occasional updates if something big happens, and Kyle and I both will be posting frequently on social media. 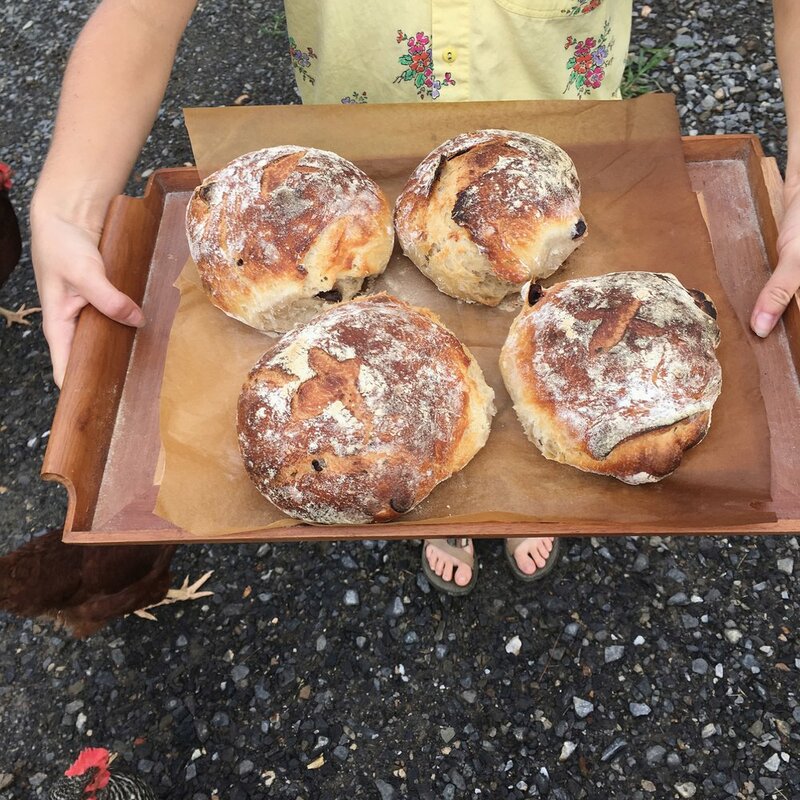 Shifting my responsibilities will allow me to focus more on farming and baking beautiful breads. This is our favorite time of the growing season, with its feel of new possibilities and shifty February weather which brings forward an anticipation of spring. This week, we started seeding in the greenhouse, and were grateful to receive a grant from NC AgVentures, as part of the NC Tobacco Trust, which will allow us to renovate and update our greenhouse space. 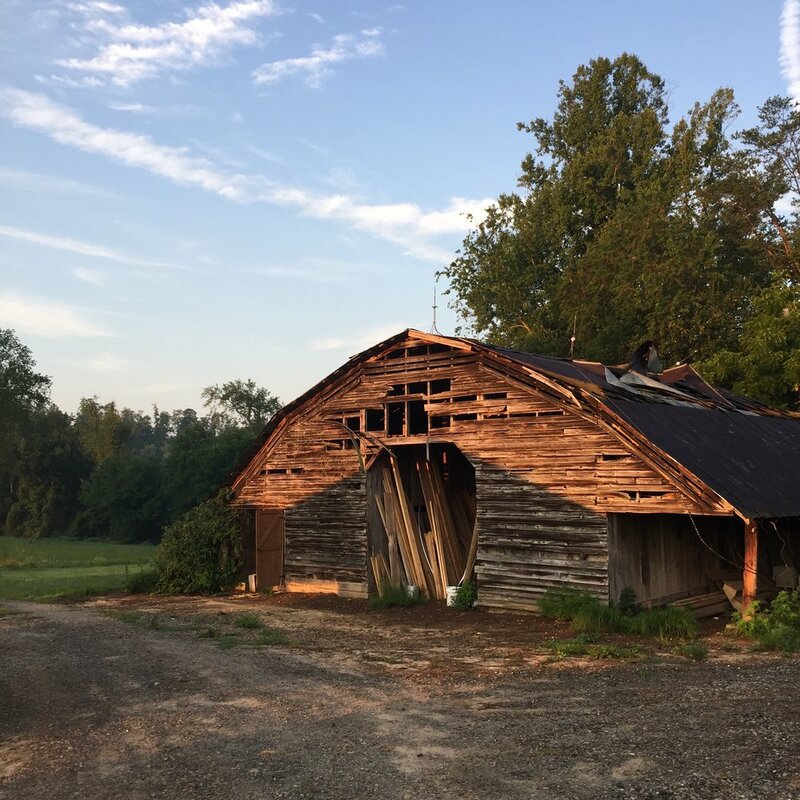 To make the farm more inviting, we’ve been working hard these last few months to clean up around the farmhouse, the fields, and the new barn, and have plans for beautifying each space on the farm, including some exciting projects that we haven’t announced publicly yet, but will soon! The chickens are now fenced in their own run and we are working diligently on a solution for all of the mud we collected from the record-breaking amount of rain we’ve had. All of these projects are giving both of us so much life as we work towards our goals. With the fall of the white pine, everything is opening up to the light. As with anything in life, it’s much easier to gloss over the vulnerability, loss, and negative aspects in favor of a more stylized and idealistic portrayal of what we wish to put out into the world. This is not the way a portrait of a farm should look, and yet I see so many farms on social media, and in person, with beautiful photographs, language, and infrastructure to even highlight one of the humblest, and dirtiest, of jobs. I’ve noticed we’ve been guilty of the same in order to maintain some semblance of an image that looks good to the outside world, even when we’re struggling to survive the madness of each day. We’ve given a lot of attention to our use of media and it is true that green plants are beautiful in the sunshine, but so too is the rain, the mud, the everyday hurdles. I’m here to recap this season. Not to glorify the dirt, but to embrace the task of chronicling what this season brought: good and bad. I feel, more than any other year on the farm so far, that understanding the successes and owing up to the failures of a year is exactly what farming is and should be. So, let’s get started. This season has been a reckoning of an example to us that we are not in control: not of our image, not our plans for the year, not of the weather. So much has happened in the last year that it wouldn’t be useful, for us or you, to describe every detail. Instead, I will set the scene of the yearly cycle and give a quick mention of the bigger happenings of each month: in other words, we’ll walk through a sketch of 2018 together. If there is a theme for 2018, it would be: patience. Many may not know this but we begin planting seeds in the greenhouse in late January in the cold with a space heater on full blast. We’re seeding onions first because they take the longest to grow and move towards brassicas, lettuces, greens, and herbs. This year we flipped our small hoop house #1 and planted mesclun, radishes, and spinach. Kyle plumbed the outdoor sink for the barn and we made a huge effort to plan and revisit our marketing strategies, which farms have to do like any other business! In February we were lucky to host a screening of Somewhere in Beulah Land, a short film made about Kyle’s journey in starting York Farm, in our hometown and the turnout astounded us. By the end of the month, we had a slab poured in the barn and Kyle finished his tool room and an office. We had a greenhouse full of trays of small plants and had plans to build a new, larger one behind, which we couldn’t find time to construct this year. March was incredible because we purchased a tractor and started prepping the bottomland, which we decided to move to completely, having used the orchard and other pieces of land on the farm in previous years. Using the tractor for the first time meant learning a whole new system of equipment, which had its challenges and forced us to learn quickly, even though we hoped that having a tractor would ultimately save us time. 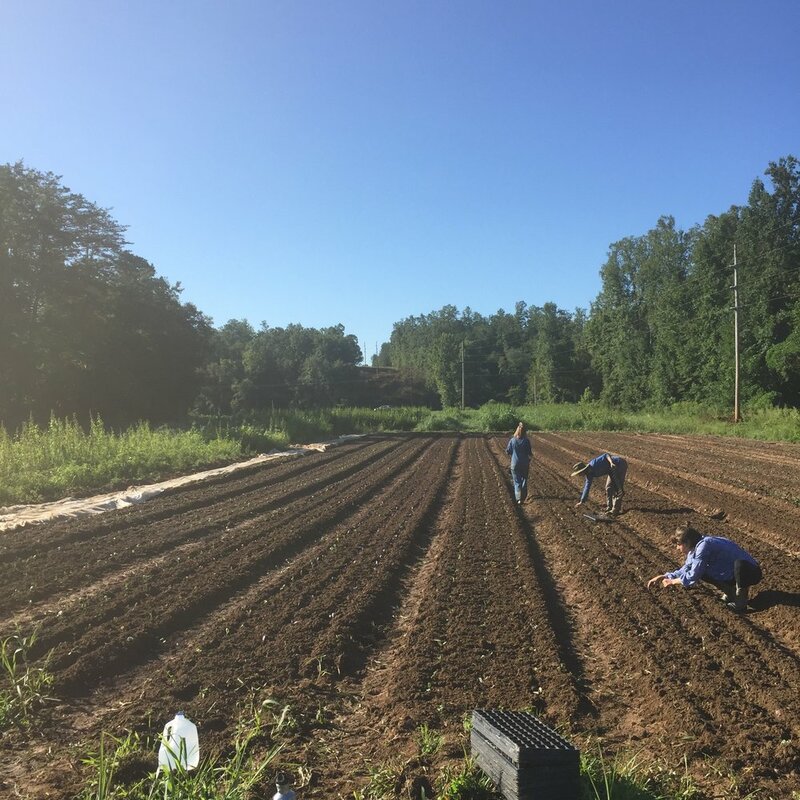 After the land was prepped, we seeded all the carrots, beets, turnips, and other roots in the soil and transplanted kale, greens, brassicas, kohlrabi, and fennel. Compost from an OMRI source was delivered. 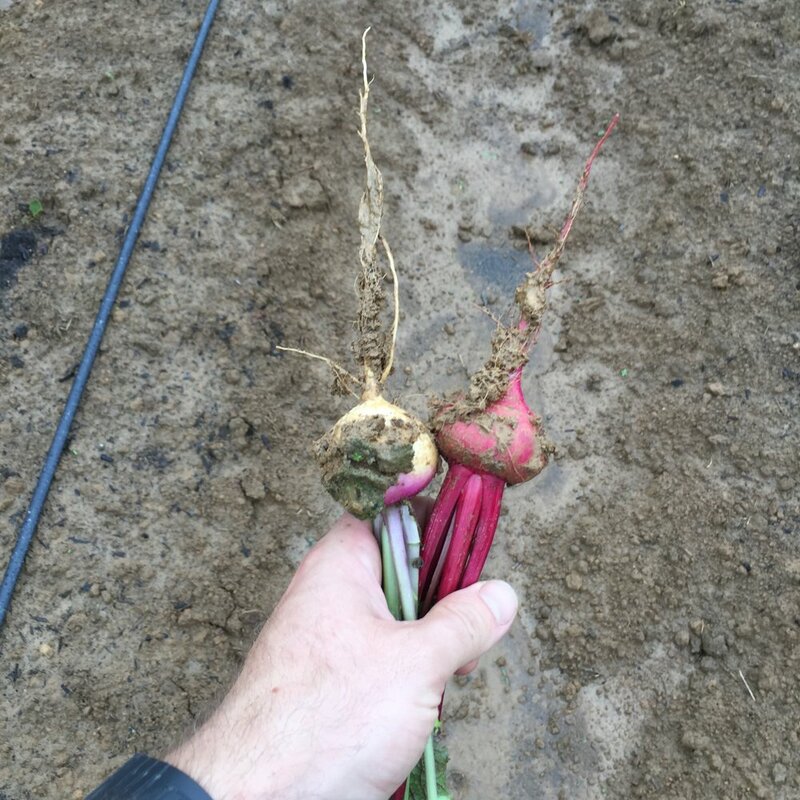 Our first harvest of the year was french breakfast radishes from hoop house #1. Every year April means that we are in full swing, with the CSA only a month away. It’s a pretty stressful time to finish all the transplanting and to mentally prepare for the exhausting season ahead. It really started raining a lot during this time and though it worried us, we tried to keep positive. The first week of May we began our CSA, that we doubled in membership from last year, endured those first cold harvests in the rain and started seeding and planting for summer. We opened our farm to the public for the first time through an on-farm store, which helped us engage with our community more directly and was both wonderful and tiresome! 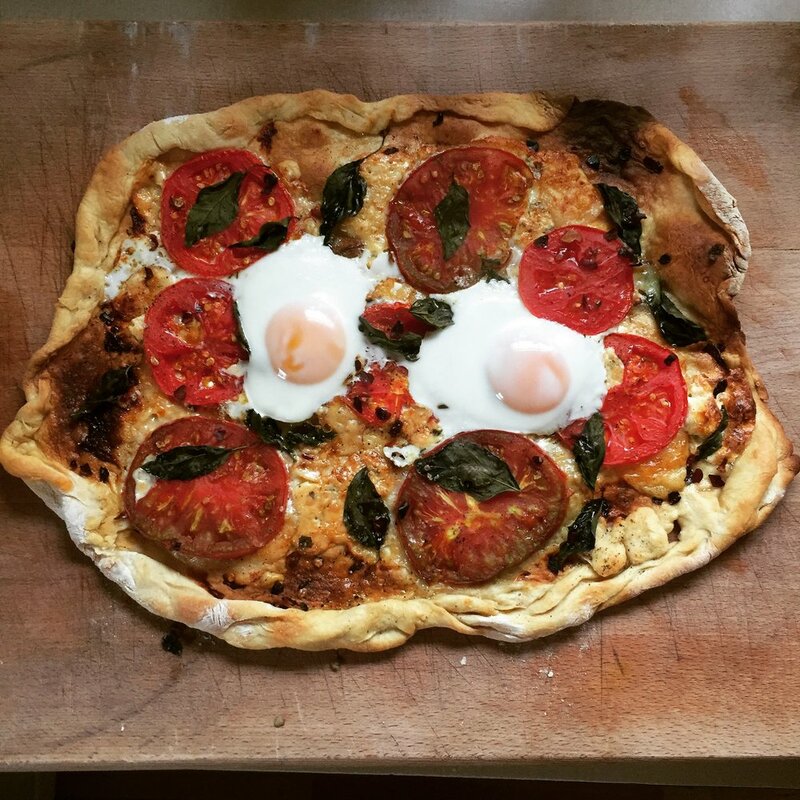 I started baking bread pretty vigorously without a clue how much of my time would be spent on both in setting up on Saturdays and the preparations beforehand, which we didn’t realize would hurt us by cutting into one of our work days. June brought us two amazing part-time employees that we could not say enough good about. These two women busted it to help us harvest for the CSA each week on Wednesdays and Thursdays and we could not have made it through this year without their hard work and even sweeter attitudes. This was one of the only dry months we had this year and everything felt like it was moving along well. I planted a flower garden and we harvested cabbage, broccoli, squash, and carrots. For the 4th of July we grilled our first cayenne and I made a pie, using some wild blackberries. During the rest of the month, we built a second small hoop house (#2), seeded for the fall, picked apples, and purchased an old cultivating tractor, called a Farmall Cub. The rain was back in full force and flooded a beautiful crop of squash that we hoped to harvest at the end of the month. Tomatoes were looking the best they ever have and we harvested a lot of potatoes! The deer really started to present us with challenges that we would face the remainder of the year, causing us to cover crops in the summer that should not be covered, from total loss of a crop of radicchio to fungal diseases on the crops that were covered. 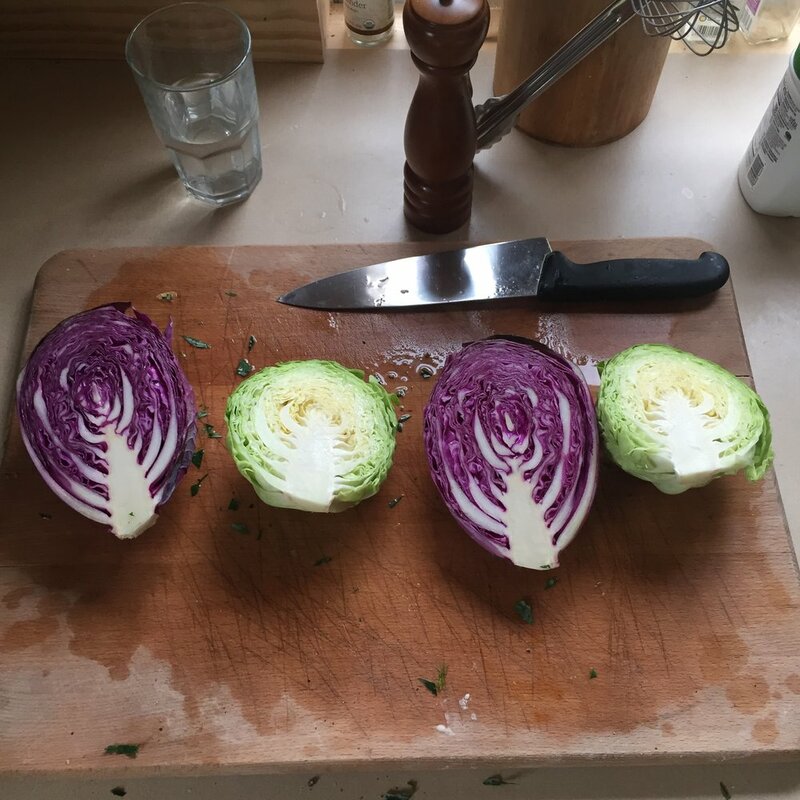 In August we made a decision to break from the CSA because wet conditions, damage from the deer, and holes in our plans for the year meant that we didn’t have a substantial variety of vegetables to give. 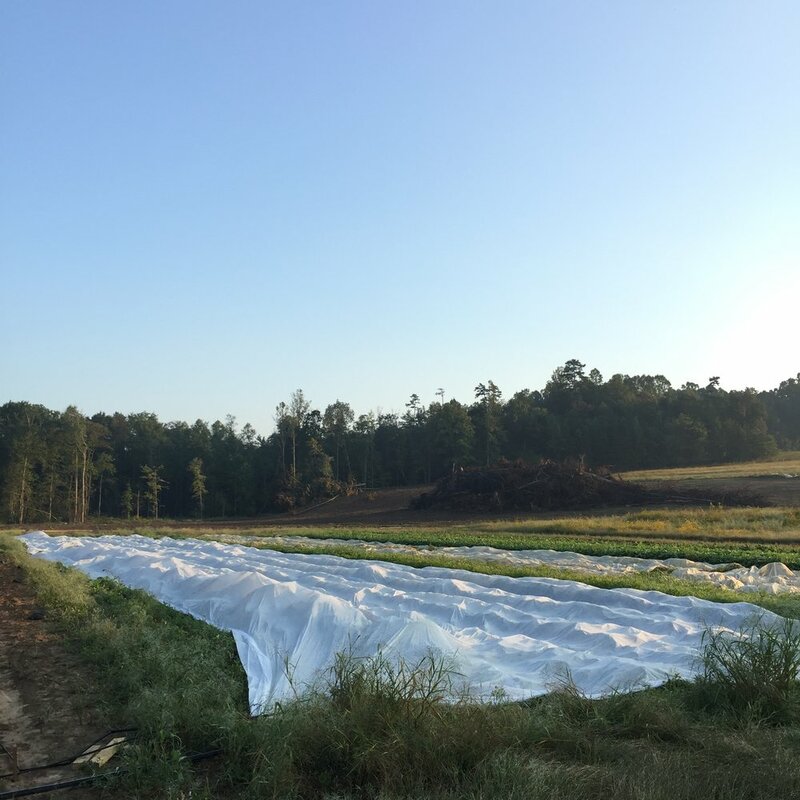 During the break, we busted it to deconstruct a 30 x 140 hoop house that we would then plant the majority of our late fall crops into, to transplant all of our fall brassicas and crops, and had some local guys clear a new patch of bottomland for us. We also took some time to tighten our crop plan to avoid, if we could, further loss and damage. September, the sunflowers, cosmos, and marigolds bloomed! 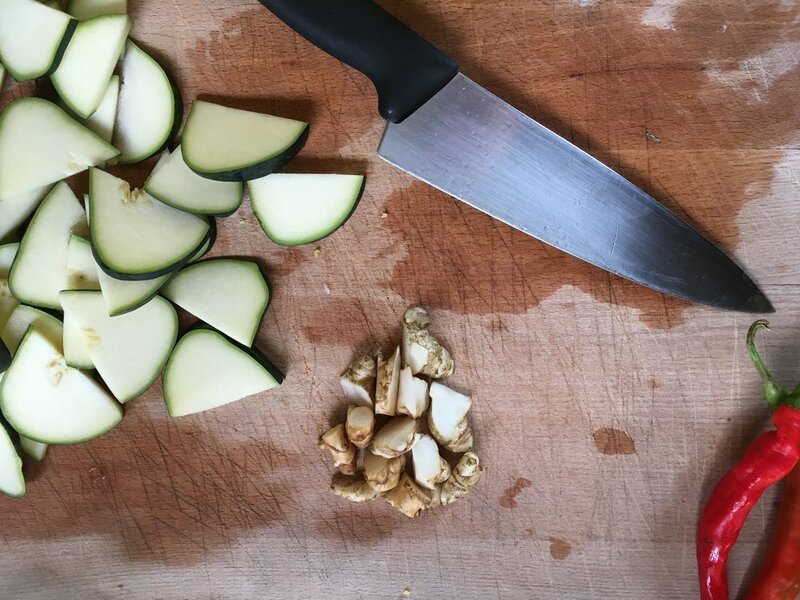 The CSA began again and we felt more grounded and prepared to resume the season, though our first harvest of winter squash was a big disappointment because the weeds in that far field got away from us. We rebuilt the 30 x 140 hoop house (#3) in the bottomland and planted up the whole of it in greens, lettuce, beets, and broccolini. In October Kyle seeded a cover crop of peas and wheat in the new bottomland and the creek flooded for the first time since we’ve been here, causing damage to new beds of seedlings. Our brassicas were growing slower than usual. We decided that this month was a good time to end the farm store for the season. There were some crop losses this month to the rain and the deer that we didn’t foresee. Our spirits weren’t particularly high at this point in the year but we were so thrilled each week to see the bounty that came from carefully tending to the crops in hoop house #3. Our chickens stopped laying due to an early cold spell in November. We harvested from all of our hoop houses primarily each week and our variety of crops wasn’t what we’d hoped in August. Because we hold our CSA variety and quality to a high standard, we decided that the best option was to end the season two weeks early, totaling 28 weeks. This was the hardest and most painful decision we’ve made as a farm, and truly took it out of both of us. I’m not looking, of course, to tell a narrative for pity but to be honest that we felt like we had failed ourselves and our members. Looking back, we had extended our growing season two weeks longer than in any year previous, harvested, cleaned, and packed nearly 1,000 boxes, and made it through a pretty rough year with our selves still in tact. December was truly a welcome sight. The experience of having a difficult year has, in one sense, made us question everything: what we are doing and how we do it. But, we are extremely thankful to have learned from our failures and successes this year, which we are now incorporating into a master plan for next year. It has been a journey, but we are taking this month slow to be able to reset, plan, and be ready for the beautiful calling to grow vegetables in 2019, and for years to come.